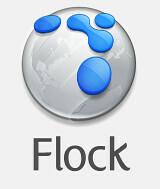 I read a blog entry today, Introducing Flock Beta 1 which, oddly, translates to Flock 0.7. That was all well and good, until the beta showed there was much work to be done, much promise to be fulfilled. I left Flock after one use. That said, after reading the above blog entry, I was willing to take another look. Direct blogging within the app, direct uploading to Flickr and bookmark sync with del.icio.us… and coincidentally, integrated Yahoo! search… if you’re not up on business in the valley… all three of those entities are owned by Yahoo! Never the less, Flickr and del.icio.us are both best of breed apps, so Yahoo knows how to pick them. People keep talking about Google secretly building a browser… and here’s a browser built by a private, for-profit company… for Yahoo! Yes, I’m sure Y! has kicked some cash to the Flock kids, too. This post is coming from the built-in blogging client, which allowed me to enter my WordPress credentials and elegantly hooked me up with instant blogging. You can control-click any page and get a menu option to blog the page’s link… which pulls up the page’s title auto-hyperlinked. Since my WP blog isn’t my tech blog, I will transfer this post to there, too. The blogging app is just like the one embedded in the WordPress post entry page, if you’re using a Mozilla/Gecko browser. Or, if you’ve used a web forum based upon vBulletin, it’s like the “advanced” composer. I think it’s a little awkward… like a hybrid web-desktop app. I think it’s great on a webpage, but weak since it is a desktop app. Especially, one I’m using on Mac OS X, since the Mac OS provides so many amazing tools for apps to use for free. the best of these, is the automatic text fields… gives a developer/user all the cool things TextEdit can, the best of which is the built-in spell checking and dictionary+thesaurus services, powered by the Oxford Dictionary. All of which are of utmost use to bloggers. There is a spell check option in the blogging client, but it’s average. It could really use a keyboard shortcut for hyperlinking. And of course, now a geeky request that will never be answered (unless someone could write a Flock extension to accomplish it? )… I would prefer to use Textile for markup, instead of HTML or WYSIWYG buttons. The photo section is impressive. The icon image at the beginning of this post is a product of the Flickr uploader built right in to the app. Worked great looked great. Some of the best UI design (visual and usability) in the app. The overall app is pretty for Windows, beautiful for Linux, it’s only ho-hum for Mac OS X. These guys should hire the Camino crew for their Mac development. It certainly looks better than regular Firefox, though. Actually, I had to tweak the code some too. There were some random break elemtns in there breaking our validation. And the image didn’t include the alt atribute. Even though I usually just log in and use our back end I think I’ll stick with ecto for now.